Smith laid the foundations of classical free market economic theory. The Wealth of Nations was a precursor to the modern academic discipline of economics. In this and other works, he expounded upon how rational self-interest and competition can lead to economic prosperity. Smith was controversial in his own day and his general approach and writing style were often satirised by Tory writers in the moralising tradition of William Hogarth and Jonathan Swift. In 2005, The Wealth of Nations was named among the 100 Best Scottish Books of all time. The minor planet 12838 Adamsmith was named in his memory. Smith was born in Kirkcaldy, in the County of Fife, in Scotland. 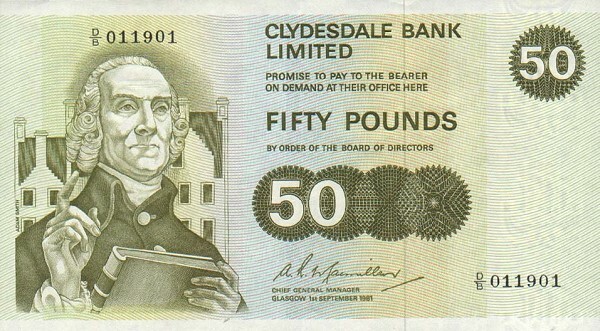 His father, also Adam Smith, was a Scottish Writer to the Signet (senior solicitor), advocate, and prosecutor (Judge Advocate) and also served as comptroller of the Customs in Kirkcaldy. In 1720 he married Margaret Douglas, daughter of the landed Robert Douglas of Strathendry, also in Fife. His father died two months after he was born, leaving his mother a widow. The date of Smith's baptism into the Church of Scotland at Kirkcaldy was 5 June 1723, and this has often been treated as if it were also his date of birth, which is unknown. Although few events in Smith's early childhood are known, the Scottish journalist John Rae, Smith's biographer, recorded that Smith was abducted by gypsies at the age of three and released when others went to rescue him. [N 1] Smith was close to his mother, who probably encouraged him to pursue his scholarly ambitions. He attended the Burgh School of Kirkcaldy—characterised by Rae as "one of the best secondary schools of Scotland at that period"—from 1729 to 1737, he learned Latin, mathematics, history, and writing. In the work, Smith critically examines the moral thinking of his time, and suggests that conscience arises from dynamic and interactive social relationships through which people seek "mutual sympathy of sentiments." His goal in writing the work was to explain the source of mankind's ability to form moral judgement, given that people begin life with no moral sentiments at all. Smith proposes a theory of sympathy, in which the act of observing others and seeing the judgements they form of both others and oneself makes people aware of themselves and how others perceive their behavior. The feedback we receive from perceiving (or imagining) others' judgements creates an incentive to achieve "mutual sympathy of sentiments" with them and leads people to develop habits, and then principles, of behavior, which come to constitute one's conscience. There is disagreement between classical and neoclassical economists about the central message of Smith's most influential work: An Inquiry into the Nature and Causes of the Wealth of Nations (1776). Neoclassical economists emphasise Smith's invisible hand, a concept mentioned in the middle of his work – Book IV, Chapter II – and classical economists believe that Smith stated his programme for promoting the "wealth of nations" in the first sentences, which attributes the growth of wealth and prosperity to the division of labour. Smith added, however, that the "abundance or scantiness of this supply too seems to depend more upon the former of those two circumstances than upon the latter." Alfred Marshall criticised Smith's definition of economy on several points. He argued that man should be equally important as money, services are as important as goods, and that there must be an emphasis on human welfare, instead of just wealth. The "invisible hand" only works well when both production and consumption operates in free markets, with small ("atomistic") producers and consumers allowing supply and demand to fluctuate and equilibrate. In conditions of monopoly and oligopoly, the "invisible hand" fails. Nobel Prize-winning economist Joseph E. Stiglitz says, on the topic of one of Smith's better known ideas: "the reason that the invisible hand often seems invisible is that it is often not there." In light of the arguments put forward by Smith and other economic theorists in Britain, academic belief in mercantalism began to decline in Britain in the late 18th century. During the Industrial Revolution, Britain embraced free trade and Smith's laissez-faire economics, and via the British Empire, used its power to spread a broadly liberal economic model around the world, characterised by open markets, and relatively barrier free domestic and international trade. Joseph Schumpeter criticised Smith for a lack of technical rigor, yet he argued that this enabled Smith's writings to appeal to wider audiences: "His very limitation made for success. Had he been more brilliant, he would not have been taken so seriously. Had he dug more deeply, had he unearthed more recondite truth, had he used more difficult and ingenious methods, he would not have been understood. But he had no such ambitions; in fact he disliked whatever went beyond plain common sense. He never moved above the heads of even the dullest readers. He led them on gently, encouraging them by trivialities and homely observations, making them feel comfortable all along." Smith's most prominent disciple in nineteenth-century Britain, peace advocate Richard Cobden, preferred the first proposal. Cobden would lead the Anti-Corn Law League in overturning the Corn Laws in 1846, shifting Britain to a policy of free trade and empire "on the cheap" for decades to come. This hands-off approach toward the British Empire would become known as Cobdenism or the Manchester School. By the turn of the century, however, advocates of Smith's second proposal such as Joseph Shield Nicholson would become ever more vocal in opposing Cobdenism, calling instead for imperial federation. As Marc-William Palen notes: "On the one hand, Adam Smith’s late nineteenth and early twentieth-century Cobdenite adherents used his theories to argue for gradual imperial devolution and empire ‘on the cheap’. On the other, various proponents of imperial federation throughout the British World sought to use Smith’s theories to overturn the predominant Cobdenite hands-off imperial approach and instead, with a firm grip, bring the empire closer than ever before." Smith's ideas thus played an important part in subsequent debates over the British Empire. A large-scale memorial of Smith by Alexander Stoddart was unveiled on 4 July 2008 in Edinburgh. It is a 10 feet (3.0 m)-tall bronze sculpture and it stands above the Royal Mile outside St Giles' Cathedral in Parliament Square, near the Mercat cross. 20th-century sculptor Jim Sanborn (best known for the Kryptos sculpture at the United States Central Intelligence Agency) has created multiple pieces which feature Smith's work. At Central Connecticut State University is Circulating Capital, a tall cylinder which features an extract from The Wealth of Nations on the lower half, and on the upper half, some of the same text but represented in binary code. At the University of North Carolina at Charlotte, outside the Belk College of Business Administration, is Adam Smith's Spinning Top. Another Smith sculpture is at Cleveland State University. He also appears as the narrator in the 2013 play The Low Road, centred on a proponent on laissez-faire economics in the late eighteenth century but dealing obliquely with the financial crisis of 2007–2008 and the recession which followed – in the premiere production, he was portrayed by Bill Paterson. Some commentators have argued that Smith's works show support for a progressive, not flat, income tax and that he specifically named taxes that he thought should be required by the state, among them luxury goods taxes and tax on rent. Yet Smith argued for the "impossibility of taxing the people, in proportion to their economic revenue, by any capitation" (The Wealth of Nations, V.ii.k.1). Smith argued that taxes should principally go toward protecting "justice" and "certain publick institutions" that were necessary for the benefit of all of society but that could not be provided by private enterprise (The Wealth of Nations, IV.ix.51). He added, however, that in general a retaliatory tariff "seems a bad method of compensating the injury done to certain classes of our people, to do another injury ourselves, not only to those classes, but to almost all the other classes of them" (The Wealth of Nations, IV.ii.39). Economist Daniel Klein believes using the term "free market economics" or "free market economist" to identify the ideas of Smith is too general and slightly misleading. Klein offers six characteristics central to the identity of Smith's economic thought and argues that a new name is needed to give a more accurate depiction of the "Smithian" identity. Economist David Ricardo set straight some of the misunderstandings about Smith's thoughts on free market. Most people still fall victim to the thinking that Smith was a free market economist without exception, though he was not. Ricardo pointed out that Smith was in support of helping infant industries. Smith believed that the government should subsidise newly formed industry, but he did fear that when the infant industry grew into adulthood it would be unwilling to surrender the government help. Smith also supported tariffs on imported goods to counteract an internal tax on the same good. Smith also fell to pressure in supporting some tariffs in support for national defence. ↑ Otteson, James R. 2002, Adam Smith's Marketplace of Life. Cambridge: Cambridge University Press, 2002. ↑ 135.0 135.1 Buchholz, Todd (December 1990). pp. 38–39. This page was last modified on 9 January 2016, at 05:36.